• Tate Modern is offering a limited number of free tickets to Soul of a Nation: Art in an Age of Black Power exhibition this Friday night (August’s Uniqlo Tate Late event) to coincide with the Notting Hill Carnival weekend. The tickets will be offered a first come, first serve basis from 6pm. The exhibition, which explores what is meant to be an African American artist during the civil rights movement and at the birth of the Black Power movement, runs until 22nd October. For more, see www.tate.org.uk. • On Now: The City is Ours. This major interactive exhibition at the Museum of London explores some of the key issues that affect Londoners and city dwellers elsewhere the world – from housing affordability and urban planning to transport, green spaces and air quality. Spread across three of the museum’s temporary exhibition spaces, key exhibits include a nine metre wide film, Urban Earth, which visualises and compares data from major cities around the world, an Oculus Rift headset which delivers a virtual view from the top of a Hong Kong skyscraper illustrating the impact of building upwards instead of outwards, and an exhibit which allows visitors to control and monitor CCTV cameras as they reflect on the impacts of increased surveillance. The free exhibition – at the heart of the museum’s year long focus on City Now City Future – can be seen until 2nd January. For more, see www.museumoflondon.org.uk/thecityisours. Send all items for inclusion to exploringlondon@gmail. 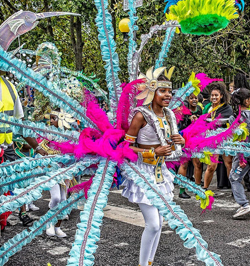 • The Notting Hill Carnival – the largest festival of its kind in Europe – takes place in London’s west this Sunday and bank holiday Monday. More than a million people are expected top attend to see the floats, listen to the traditional steel drum bands and sample some of the food found at the hundreds of stalls along the streets of Notting Hill. Sunday, when the costume prizes are awarded, has been designated as Children’s Day and Monday, when the main parade takes place, as Adult’s Day. The festival has been held every summer since 1966. For more, see www.thenottinghillcarnival.com. • With the memories of the Olympics still fresh in our minds, it’s time to turn our attention to the impending Paralympics and associated events including the 24 hour Torch Relay which hits London next Wednesday, just before the Opening Ceremony. The torch enters London at Watford and and then moves south through the city, taking in many of London’s most famous landmarks as it visits all six boroughs before arriving at the Olympic Stadium. For more on the route, see www.london2012.com/paralympics/torch-relay/route/. Meanwhile, as with the Olympics, those who don’t have tickets to the Paralympics will be able to watch on a giant screen at Trafalgar Square daily between 11am and 10pm where there will also be live music and activities including the chance to try out a range of Paralympic sports. For more, see www.btlondonlive.com/trafalgar-square. Tower Bridge, meanwhile, is undergoing a makeover with the installation of the Paralympics symbol, Agistos, tomorrow following the earlier removal of the Olympic Rings. Historic projections, meanwhile, will once again appear on the Houses of Parliament. Other events taking place around the Paralympic Games include Surprises: What You Will: Pop-Up Shakespeare – which will see Shakespearean characters like Juliet, Hamlet and Puck suddenly appearing and performing at “cultural hotspots” around the city (the exact time and location of the performances will remain a surprise until the day but you can register for updates at www.molpresents.com/surprises or follow @molpresents and @London2012Fest. • A series of artworks by South African-born Expressionist Albert Adams are on show at the Imperial War Museum this summer. The works on show include the last painting he completed before his death in 2006 – title Abu Ghraib, it was inspired by reports of abuse perpetrated at the Abu Ghraib prison in Iraq – as well as a series of etchings Adams created between 2001 and 20064 which address conflicts like that Iraq War and Darfur. Admission is free. For more, see www.iwm.org.uk. On Now: Anatomy of an Athlete – Elite sport, surgery and medical art. This exhibition in the Qvist Gallery at the Royal College of Surgeons’ Hunterian Museum in Lincoln’s Inn Fields features new artworks by world-leading medical artists which explore the anatomy and physiology of elite athletes. The art works come in a variety of forms – watercolour, video and sculpture – and represent the human body in a selection of sports and para-sports. Admission if free. Runs until 29th September. For more, see www.rcseng.ac.uk/museums/.